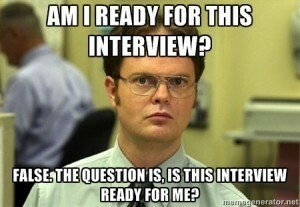 Interviewing: Don’t be intimidated, be prepared! It’s fair to say that the interview process is often a dreaded and scary experience, especially for students who may not have a lot of experience with interviewing. We might spend hours Googling interview questions and perfecting our responses, to later find the interviewer asking entirely different questions. Then you find your mind goes blank and you become even more nervous and unsure of yourself. 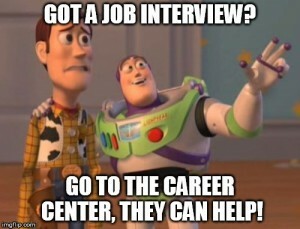 Luckily, right here at the Career Center we are hosting a “Coffee & Questions” session to talk about interviewing tips and advice to make you a confident interviewee when the time comes. Practice, practice, and more practice! The only way to feel comfortable in an interview is to be prepared through practice. The Career Center offers mock interviews where you can simulate a real interview and receive helpful feedback. You can even choose to have your session recorded to take home and review. I recently participated in a mock interview at the Career Center which I found to be helpful and enlightening. Before the mock interview, I assumed that my interview skills were great and didn’t need adjustments because I’ve been fortunate in getting most jobs that I apply to. The mock interview taught me that there is always room for improvement. I learned that when answering a question like “what are your strengths and weaknesses,” you should try to give specific examples from your prior experiences to provide better illustrations for the interviewer. Also, when I spoke about a weakness, I learned that it helps to explain to the interviewer an example of a positive step I am taking to overcome that weakness. This highlights self-awareness and shows that you are working to continuously improve yourself. Overall, the whole process allowed me to be more conscious of my interviewing style, so I can better prepare myself to answer questions successfully during a real interview. “Tell me a little bit about yourself…” can be a surprisingly difficult question to answer if you’re not prepared. You might find yourself giving a 10-minute soliloquy on your life story. It helps to develop an Elevator Speech of 60-90 seconds (i.e., the time it takes to ride in an elevator) to tell the interviewer a little bit about yourself, why you are interested in the open position and how you are a great fit for this opportunity/employer/industry. 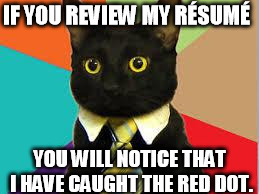 My number one tip would be to study your resume! Research yourself and draw from prior experiences so that you can make the connections easily when asked. Dress to impress! How you physically present yourself can make or break your interview. By wearing appropriate attire, you are showing the interviewer that you are professional and can be taken seriously. A clean and pressed dark suit (matching jacket and pants/skirt) is usually considered appropriate attire for most interviews; be sure to have dark socks to match with a dark suit, wear a minimum amount of jewelry/accessories, and perfume/cologne should be applied sparingly or not at all. Overall, your attire should play a supporting role and should leave the interviewer to have a good impression. You want him/her to focus on you and your interview responses – not on your appearance. If you are unable to attend this event, you can also stop by the Career Center during walk-in hours (Monday-Friday, 12-4pm) or schedule an appointment! We also have some resources on our website to help you get started with preparing for an interview. ← Day 1 & 2.